My Nanking cherries (Prunus tomentosa) made a lot of people happy this year. Joy was first spread in early April as thousands of pinkish white flowers burst open along the stems, enough to almost completely hide the stems. Passers-by enjoyed the hedge of plants, which run along the driveway; some people even asked about the name of the plant. In early June, the blossoms morphed into small, red cherries, oodles and oodles of them. Now, the end of June as I write, just a few cherries still cling to the stems. Throughout the month of June, though, friends, strangers, relatives, birds, chipmunks, and creatures unseen feasted on the abundance. Nanking cherries are admittedly small and somewhat hard to harvest because they cling closely to the stems on short stalks, but these two deficiencies are far offset by the care the plants need. Almost none! Every few years, I whack back some stems that become decrepit or send the plant high or wide out of bounds.. And I usually spread wood chips or leaves beneath the bushes as mulch to suppress weeds and conserve soil moisture. But neither of these minor tasks is absolutely necessary. Perhaps the most amazing thing about Nanking cherries is that there are no improved varieties. That is, they are all random seedlings, each a genetic individual. Yet they all taste good, ranging in flavor and texture, depending on the individual, from almost sweet to sour cherry. (Compare this to wild apples, which pretty much all taste bad; the good-tasting apples that we have are the result of hundreds of years of selection and breeding.) Nanking cherry fruits are small, as are the wild cherries from which cultivated cherries are derived. One of my bushes yields cherries that are slightly larger, slightly firmer and, hence, easier to harvest, and slightly sweeter than my other 10 or so bushes. Seeds from that bush didn’t get spit on the ground; I collected them for planting. Nanking cherry bushes bear fruit within a couple of years and repeated selection of plants bearing the best fruits could result in bigger and better fruits. Improvements might also come from widening the genetic input with pollen from a wider range of Nanking cherry individuals and even some related species, such as sweet cherry. The combination of Nanking cherry’s tolerance to winter cold, late spring frosts, and insect and disease pests and sweet cherry’s fruit size, sweeter flavor, and firmness would make a plant that was easy to grow with even tastier fruits. I’ll report back in years to come. For now, run-of-the-mill Nanking cherry is well worth growing and another perfect fruit for ambulant consumption on the way to the front door or to the mailbox at the end of the driveway. I have a good excuse for the weediness of one of my gardens: It’s on a roof, not an area I frequently walk past with the opportunity to pull a few weeds. I would have to get a ladder and, because this garden is not to be walked on, reach in as far as possible. I don’t weed it. This garden is a “green roof” covering a front porch. 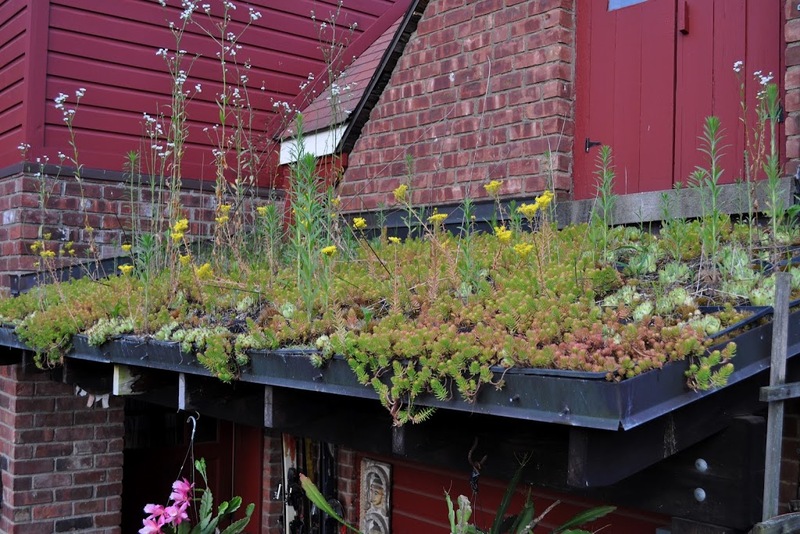 Green roofs absorb rainfall and the sun’s heat, insulate whatever is below, and look — well — green and alive. The last reason prompted my roof planting about ten years ago. But first I had to build the porch roof. Construction was standard — oak posts and crossbeam with 2 by 8 joists covered by 1 by 6 planks — except for the covering of rubber roofing bonded to copper flashing provided with weep holes at the lower end. Planting was begun the year before with hens and chicks (Sempervivum spp.) in seedling flats filled with a mix of equal parts peat moss and calcined montmorillonite clay (the latter also known as “kitty litter). That spring I snuggled the flats next to each other on the roof. Setting flats on the roof intact would, and did, prevent rainfall from washing the planting mix and plants down the slope, the angle of which was determined mostly by aesthetics. I wanted the top of the roof just visible from the driveway. The goal was for the hens and chicks to make more chicks, and those chicks to make even more chicks, spreading to make a dense, blue-green mat over the surface and draping over the lower eave. They didn’t spread thoroughly or fast enough. It takes a tough plant to survive and grow on this roof. The soil mix is only a couple of inches deep so plant roots are exposed to the full brunt of winter cold and summer heat, and the roof gets only natural rainfall. Because hens and chicks weren’t fully up to the task, I started planting other succulents to fill in bare areas amongst the hens and chicks. Over the years, the most successful of these plants has been Sedum rupestre ‘Angelina’. Not only does ‘Angelina’ survive and grow under the austere conditions, but she also looks pretty year ‘round. Right now, the plant is a trailing mat of fleshy, pointed, pale green leaves up through which push foot-high shoots capped with clusters of yellow flowers. In fall and winter, the leaves take on an amber hue. The plants root very easily to furnish new ones to fill in the few remaining bare spots. I pluck off pieces of shoots and toss them back onto the roof to eventually root and spread. Very convenient. It’s hard to imagine how weeds have gotten onto my green roof, let alone survive. Birds and wind, no doubt, got the plants there. The weeds include fleabanes and some grasses. Some people tell me that these “weeds” look pretty up on the roof, so maybe they’re not weeds. The fleabanes, now in bloom, hold their white, daisy-like flowers high above those of ‘Angelina’. And, if nothing else, both weeds . . . whoops, I mean plants . . . hold the soil in place as ‘Angelina’ continues to spread. This entry was posted in Uncategorized and tagged edible landscaping, green roof, Nanking cherries, Prunus tomentosa, Sedum rupestre ‘Angelina’. Bookmark the permalink. Trackbacks are closed, but you can post a comment. are there any nurseries nearby that sell Nanking cherries and other exotic fruits? I find that many of the fruit trees I get online and shipped, do not hold up as well as getting direct from a nursery. I don’t know where you are so don’t know if there are any nurseries “nearby.” However, there are many reputable nurseries that ship high-qulaity plants that do as well as those you buy direct from a nursery. In addition to those nurseries advertising on my blog page, I also recommend Burnt Ridge Nursery, Hidden Springs Nursery, Adams County Nursery, St. Lawrence Nurseries, Nourse Farms, and Whitmans Nursery. There are a number of other good mail-order nurseries out there also (and a number of bad ones). Thank you. We are west of you in Delaware County. We had a terrible experience with a blueberry farm in NJ. We ordered 80 plants, and all but 3 died. Later, I read more recent reviews and they were really bad. A lesson learned. We did order from nursery on your blog, and have a much better experience. Thanks for all your information. I really enjoy your blog and adhere to many of the new-learned principles of top-down gardening, plenty of compost (we have horses and chickens, grist for the compost mill), cardboard, and grass clippings. It has made a world of difference and is helping in this devastating drought we are experiencing up here in the mountains. 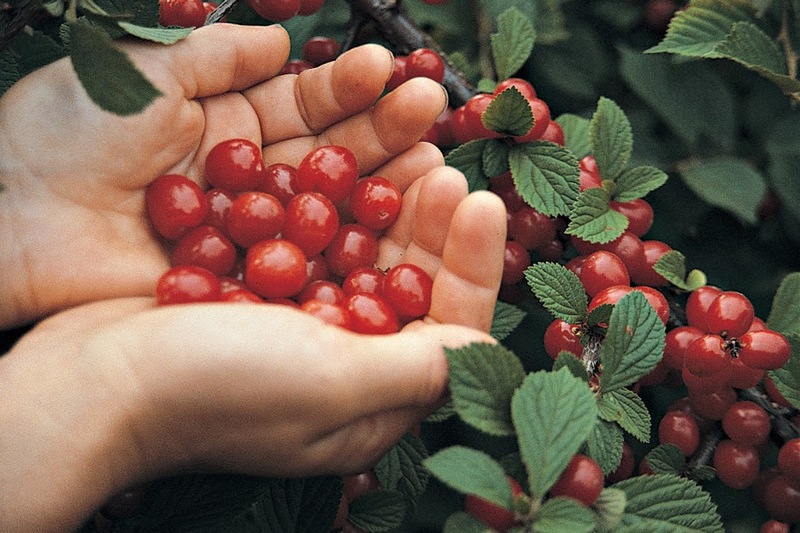 Is is ok to plant just one Nanking Cherry, or are several needed for cross-pollination? How easy is it to start them from seed? Thanks! You need at least two plants for cross-pollination. Easy to start form seed if you keep them cool and moist (refrigerated in moist potting soil, for instance) for a couple of months. Lee, what if you have Rainier, Bing, Stella and Western Sand (Besseyi) Cherry trees and shrubs. Will those pollinate the Nanking Dwarf i ordered? Thanks. I don’t believe so. Perhaps the sand cherry, though, because in Russia that’s been hybridized with Nanking cherries (as described in my book Uncommon Fruits for Every Garden). Nanking DWARF??!! Never heard of it. Are you sure about the DWARF part? From where are you getting it? I have Bing and Rainier and Stella cherry trees. They should do a good job of pollinating each other. So now I’ve ordered a Nanking Dwarf Cherry (Tomentosa) and a Dwarf Sweet Cherry (Prunus Bessey) or Sand Cherry. Now I’ve read that I should have “2 for pollination” on the Nanking and Sand Cherries. Is that really true, or will they pollinate each other, along with my Bing and Rainier and Stella? No point in having cherries that aren’t being pollinated . . . I am thinking about to send a Nanking cherry to my mother in Maiami, but it will bear fruit in Maiami? I am not sure about its chill requirement, do you think it will grow well in there? I’d like to use Nankings as a privacy shrub, as well as a fruit producer along a back fence here in Omaha, NE (zone 5b). The fence length is around 60 feet so we have quite a bit of space. I’ve read so many places on how far to plant them apart. Do you have a recommendation? They don’t have to be completely compact but would like to use them for privacy. Any advice would be helpful. Thanks! If you’re not going to prune them except very occasionally, 8 feet apart would be fine. Did you reacvh your goal of selecting and improving some of your strains of Nanking cherries, with successive seedlings ? Hi Lee, did you ever select an improved Nanking from your trees?